This book emerged from two separate, but intersecting, strands of work that began in the late 1980s, when the World Bank initiated a review of priorities for the control of specific diseases. The review generated findings about the comparative cost-effectiveness of interventions for most diseases important in developing countries. Also important for informing policy is a consistent, quantitative assessment of the relative magnitudes of diseases, injuries, and their risk factors. 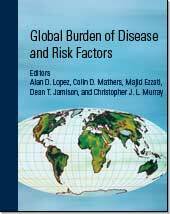 The Global Burden of Disease and Risk Factors is the definitive, scientific account of the health conditions of the world's population at the beginning of the 21st century. This book includes a full account of methods, the complete results of recent work, and an assessment of trends for total mortality and for major causes of death among children under five. In addition, two chapters cover sensitivity and uncertainty analyses in relation to a broad range of potentially important parameters.